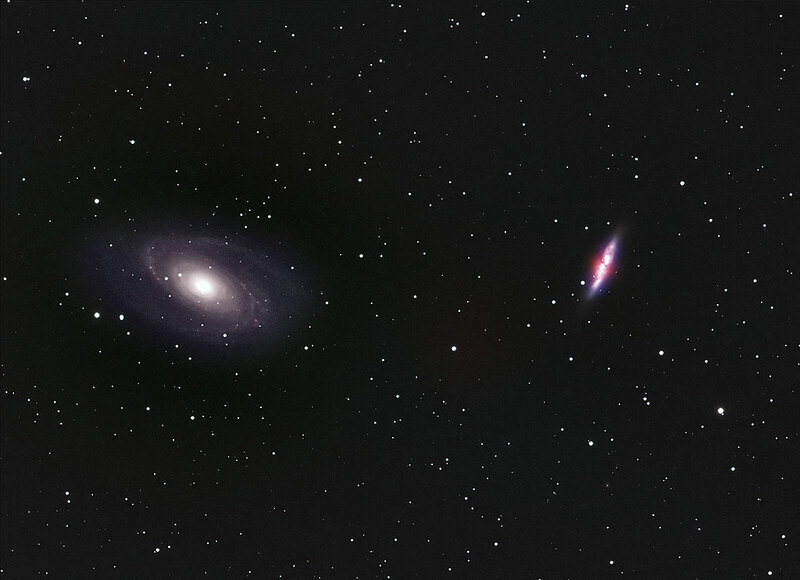 That's M81 on the left and M82 on the right. M82 is a starburst galaxy; gravitational disruption from M81 (they are a true pair, interacting gravitationally) has deformed M82 and caused clumping of hydrogen, which leads to star formation. M82 is reckoned to be forming stars at 10 times the rate of “normal” galaxies. 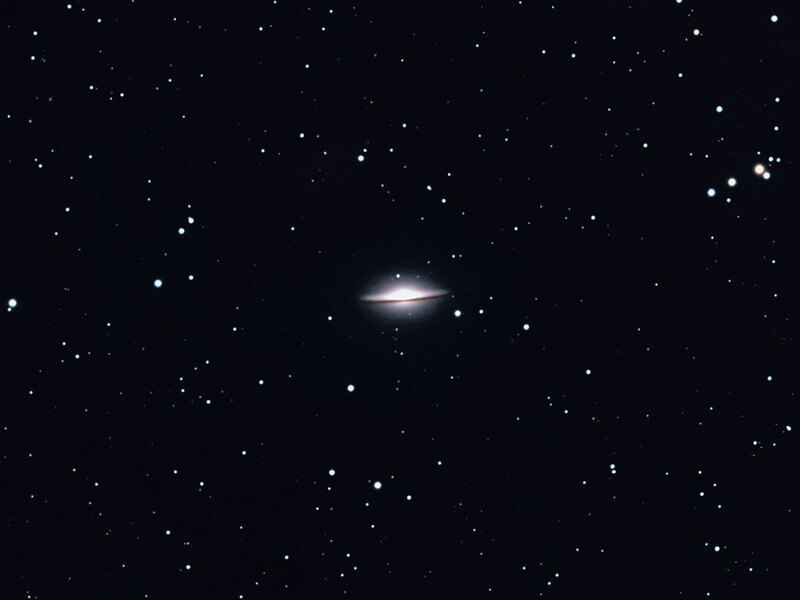 Photos taken in the near-infrared have revealed that M82 is a spiral galaxy, though that is not apparent in visible-light photos such as this one. M81 and M82 are relatively nearby at a distance of only about 12 million light years from Earth. Takahashi TOA-150, SBIG STL-11000, March 31, 2010. All-Mac image. It was discovered in the early 1900’s that M104 is moving away from the Milky Way at a velocity of about 1,100 km/sec. This was one of the earliest hints of an expanding Universe. M104 is a spiral galaxy located about 29 million light-years from Earth. Takahashi TOA-150, SBIG STL-11000. All-Mac image. 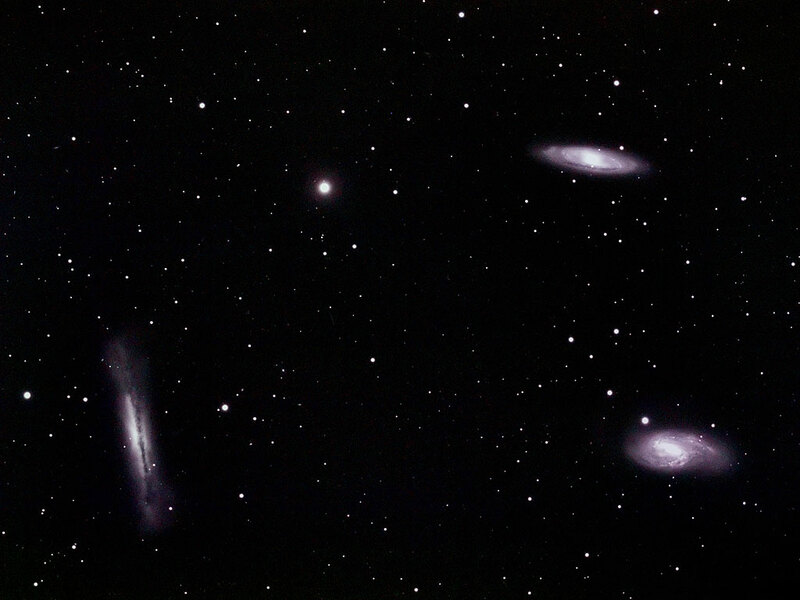 Three spiral galaxies. That’s M65 at the upper right, M66 at the lower right, and NGC 3628 at left. Note the very prominent dust lanes in these galaxies. Takashi TOA-150, QSI 583c one-shot color camera. 10 exposure of six minutes each. All-Mac Image. The barred spiral Galaxy NGC 2903 lies at a distance of 20.5 million light years in the constellation Leo. QSI 583c one-shot color camera, Takahashi TOA-150. All-Mac image. 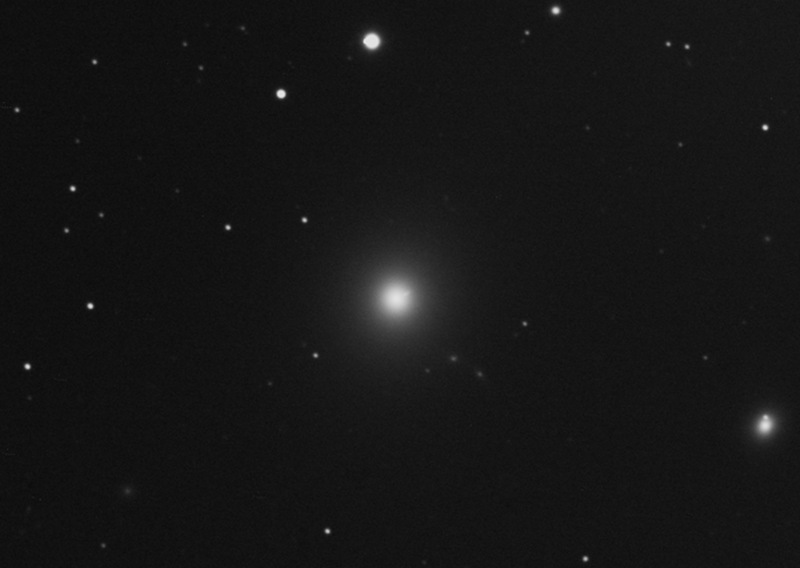 M87, also known as Virgo A, is a true giant of a galaxy. It is about 120,000 light years (LY) in diameter, compared to 100,000 LY for the Milky Way (and it is globular in shape). Its mass, measured by the motion of stars in its outer regions, is 2.4x1012 solar masses, compared to 5.8x1011 solar masses for the Milky Way. The superlatives don't end there. M87 harbors a supermassive black hole at its center. The mass of the black hole itself is estimated as 6.4x109 solar masses. In practical terms, the black hole weighs nearly 6-1/2 billion times as much as our Sun. It is among the most massive black holes known. Unlike the Milky Way's quiescent central black hole, M87’s is active. Visible in the image above is a jet of matter that is being ejected from center of M87 by dynamical processes associated with the black hole. The jet presents an optical illusion to the Hubble and other telescopes that are capable of collecting data that permits measuring the velocity of the matter in the jet; it appears to be traveling at about 5 times the speed of light, which is not possible. This optical illusion indicates that the matter in the jet is traveling at relativistic speeds, that is, at speeds very near the speed of light. The jet is about 5,000 light years in extent—1/20th the width of the Milky Way. Here is one more superlative: While M87 is not terribly far away in cosmic terms at about 53 million LY, the two galaxies known collectively as UGC 7652, seen through the galaxy’s halo, are very far away. They lie at a distance of approximately 1.2 billion light years from Earth; as far as I know, they are the most distant objects that I have photographed. The elliptical galaxy at the right edge is NGC 4478 and the smudge at the lower left is also a galaxy—PGC 41377. In fact, close inspection shows a number of dim, irregular smudges in this image. Except for UGC 7652 they are all members of the Virgo Cluster to which M87 belongs. Takahashi TOA-150, SBIG STL-11000M; one hour with a red filter. All-Mac image. This image itself presents to the viewer an interesting optical illusion. Hover your cursor over the image and you will see a gray line pointing to the jet. You will see that I have given this line a gradient, darkening that portion that overlays the glow of the galaxy for easier visibility. Except that I didn't apply a gradient to the line. The line is the same shade of gray from end to end. It only appears to darken where it passes over a lighter region. If you doubt this, e-mail me and I will be pleased to send you the original layered TIFF of the overlay image, where you may inspect the line in isolation in Photoshop, and which you may export as a JPEG for viewing in your web browser to assure yourself that it is the same image. 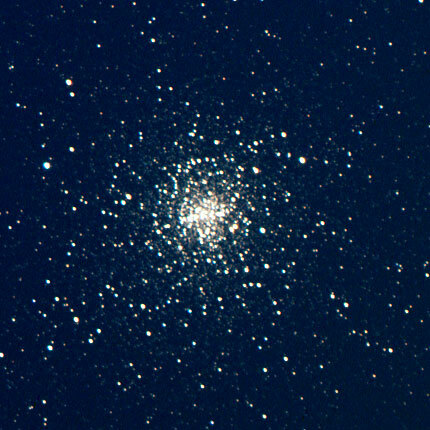 M13 is a globular star cluster in the constellation Hercules. It is about 25,000 light years from Earth and it contains several hundred thousand stars. Because it is a relatively compact object the star density at the cluster’s core is hundreds of times greater than in the vicinity of our Solar System. That means that you would see a lot of stars in the sky when you looked up at night—or maybe even the daytime—if you lived on a planet near the center of M13. The dim, extended object at the lower left of the photograph is the spiral galaxy NGC 6207. 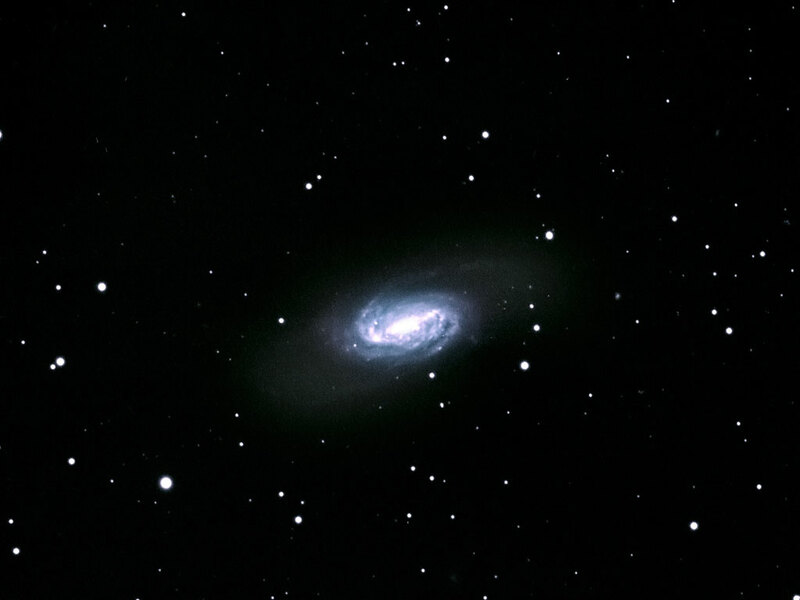 NGC 6207 is thought to have been discovered by William Herschel (Friedrich Wilhelm Herschel) in 1787, but it is a quite ordinary galaxy and it was not an object of study until a star exploded in the galaxy in 2004. This was a Type II supernova designated SN 2004A. There is a magnitude 7 foreground star (GSC 2588:1971) in the line of sight to the core of the galaxy; some have mistaken the star for a bright galactic core, but it is not; the core of NGC 7207 is undistinguished. The distance to NGC 6207 is not known with certainty, but astronomers studying SN 2004A estimated that it is from 68 to 91 million light years from Earth. That would mean that the photons that my camera captured to make this picture departed this galaxy when the dinosaurs still roamed the Earth. 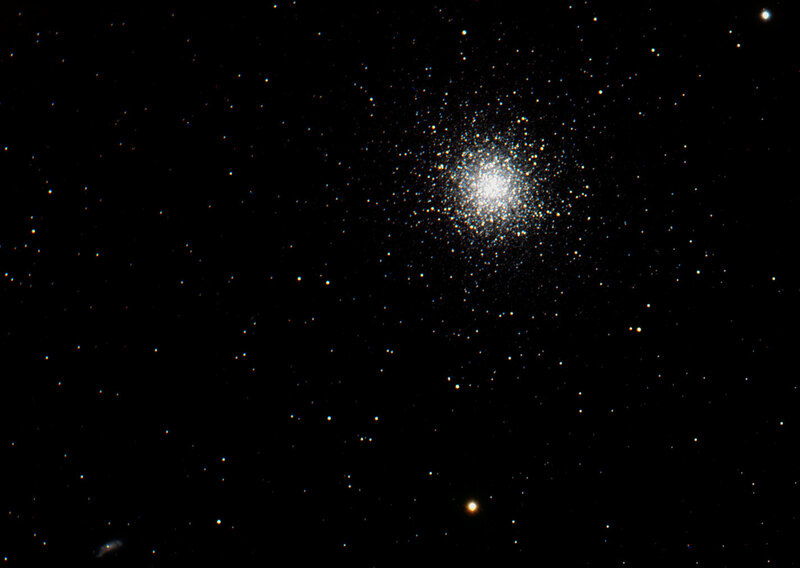 The red star below M13 is HIP 81848. Total exposure time for this photo was one hour with an SBIG STL-11000M camera and a Takahashi 150mm refractor. All-Mac image. I don't know of any other wide region of the sky that contains as much color as this one. It's all gas and, in those areas where few stars are seen, dust. The dust is similar to common soot. This soot, like the carbon in our bodies, was made inside stars millions or billions of years ago. The named objects in the photo include the globuar cluster M4 at top right (also seen at right). M4 is unique among globular star clusters in having a distinct bar (of stars) across its center, and for that reason it has been called the "cat's eye." The bright star at lower right is Antares. Above and to the left of Antares is the globular cluster NGC 6144. 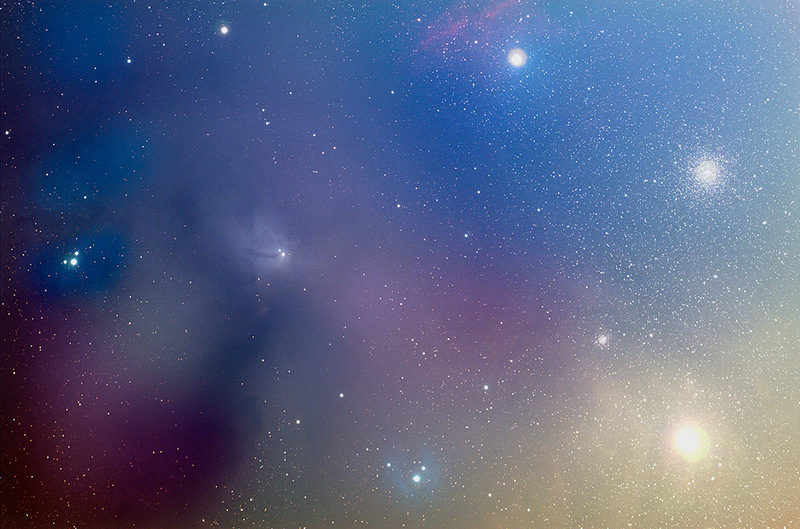 At bottom center is the bright nebula IC 4605. The star near the left edge with the koala-bear ears is Rho Ophiuchi and it is surrounded by the Rho Ophiuchi nebula. To its right, on the other side of the dark dust lane, is the bright nebula IC 4603. There is a narrow dust lane betwee us and IC 4603. Field of view: 3.9 x 2,6°. North is left, east is at bottom. Takahashi FSQ-106, SBIG STL-11000, March 31, 2010. All-Mac image.